Emmanuel Mbaka, foremost real estate developer and Managing Director of Platinum Mortgage Bank. 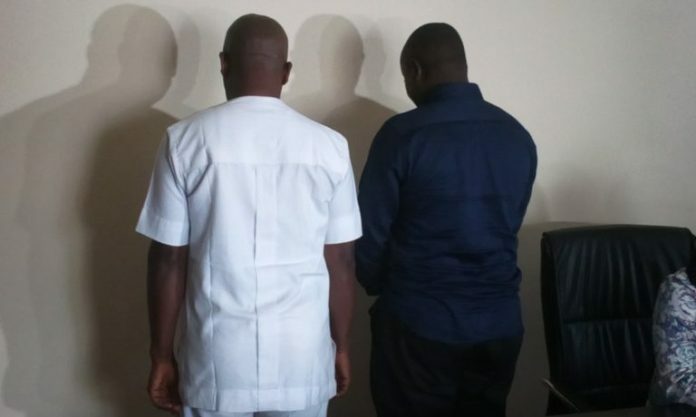 The male suspects - Jeff Ove, 37, from Bayelsa, and Mohammed Sanusi, 39, from Kogi - were presented to journalists by the spokesperson of the panel, Lucie-Ann Laha, in Abuja on Friday. Ms Laha alleged that the suspects told the panel under oath that the victim, who was present at the news briefing, had looted and stashed huge sums of money in his Abuja home. She said the bogus tip-off prompted operatives of the panel to raid Mr Mbaka’s home, an effort that ended in futility as nothing of such was found. NAN reports that Ms Laha, who apologised to Mbaka on behalf of the panel, said the suspects would be prosecuted to show that the Federal Government’s Whistleblower Policy was not an instrument of character assassination. “Conversely, when Nigerians try to circumvent this policy by giving false information in a bid to malign other Nigerians, the law says we should reprimand them, which is what we are doing here today,” she said. Speaking to journalist, the two suspects said they were in turn misled by informants, and apologised to Mr Mbaka amid pleading with the panel for forgiveness. Mr Ove said, “I was in Bayelsa when I got information that there was a fund that a politician kept in Abuja here. He said he never bothered to take the information to anti-corruption agencies because Mr Aliyu had said he wasn’t too sure of its authenticity. “But the brother of this very man (Ove) standing beside me here came all the way from Bayelsa and said he had a special power to enter the house and search it. “When we got there, he told me that the spirit had told him that there was money in the house, and that we should give him a little time to work on it,” he said. Mr Sanusi said he never knew that Mr Ove and his unidentified brother had already approached the panel to inform it about the money.